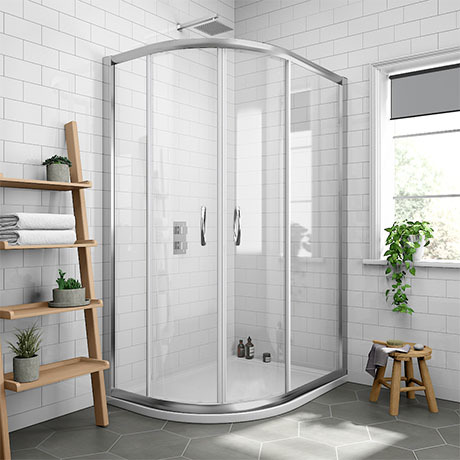 The minimalist Newark left handed offset quadrant easy fit shower enclosure with pearlstone tray features 5mm toughened glass sliding doors for easy access, with 40mm adjustment for easy fitting and a beautiful satin chrome finished frame. Supplied with a quality 40mm high white acrylic capped shower tray, constructed from a polyurethane resin mixed with filler including volcanic ash. Create a relaxing stylish retreat in your bathroom with our range of quality Newark offset enclosures. Comes with a lifetime guarantee. Q. There is a gap between the shower door when closing how do we adjust to fully close. Hi, for any technical information or data sheets please contact ourselves via phone or email info@victorianplumbing.com and we will try our best to supply you with what you require. Thanks! 1 out of 5 found this question helpful.